Even in a city under construction, you can count on the fact that one of the first functioning locale will be the place where the local underworld gathers to conduct their illicit business. 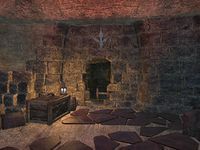 Vivec City Outlaws Refuge is an outlaws refuge hidden beneath Vivec City. 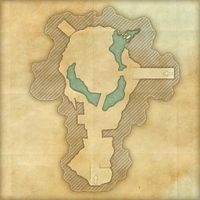 Entrances can be found near the city docks and inside the Canton of St. Delyn the Wise. 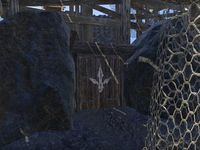 Quarith's Honest Market — A general goods stall run by Quarith. Relieves-Burdens Bargains — A guild kiosk run by Relieves-Burdens. Seal-the-Deal Fencing — A fencing stall run by Steps-in-Alleys. Thieves' Trove Finances — A bank run by Obenion. Urshra's Cleaning Services — A fencing stall run by Urshra. 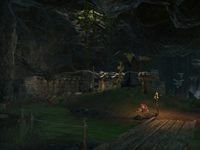 This location was originally named Vivec Outlaws Refuge. This page was last modified on 12 February 2019, at 01:06.